On June 6, 1919, The Washington Times ran an article with an intriguing headline. 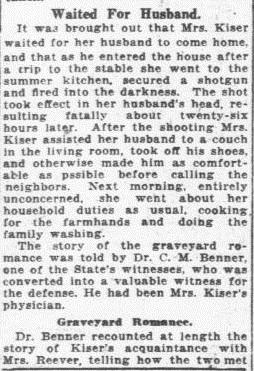 I’ve posted articles about people unable to resist the romantic allure of the graveyard before, but I somehow overlooked James Frank Kiser‘s murder at the hands of his jilted second wife, Alice. This chapter in Mr. Kiser’s story both begins and ends in the Trinity Lutheran Cemetery in Taneytown, Maryland where his first wife, Annie, was buried. It was during a visit to Annie’s grave that Mr. Kiser struck up a dialogue with Mrs. Ida Reever (possibly “Reaver“) who was also visiting a grave. The Kisers and Reevers lived near each other in Harney so they probably already knew each other. The two left the graveyard together that day, based on the testimony of Dr. Benner, a physician who’d treated both Mr. and Mrs. Kiser on separate occasions. Mr. Kiser confided in the doctor that he felt as if “heads were popping up behind every tombstone watching them” and by the time he got home, Alice knew about her husband’s new friendship via telephone gossip. Some of the details about the events of February 12, 1919 vary, but all reports arrive at the same ending. 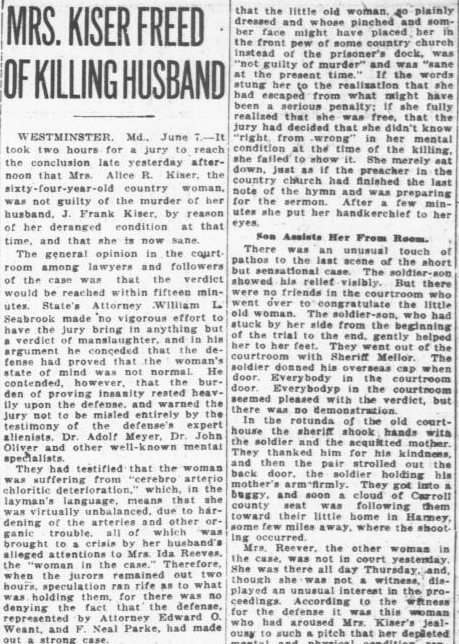 In The Washington Post, a neighborhood boy named Henry Mort testified that Mr. Kiser exited his home, made a motion with a hitching strap in the air, and proceeded down the road on foot, followed by Mrs. Reever shortly afterwards. When Mr. Kiser came home Alice was waiting for him, armed. She shot him in the head, a wound which would cause his death the next day in a Frederick hospital. Immediately after the shooting Alice helped J. Frank to the living room and took off his shoes before summoning her neighbors for assistance. In June, Alice’s lawyers used an insanity defense instead of “unwritten law” to back up her not guilty plea to the manslaughter charge. Ida, said to be “well preserved for her age” attended most of the trial but was never called as a witness. Various doctors testified that Alice’s physical conditions combined with the emotional strain of her husband’s actions caused her insanity on the night she shot him. Dr. Adolf Meyer said that while she was currently sane, she could become insane again “by any undue excitement.” The doctor who spoke for the prosecution dissented from other experts, believing that she was of sound mind on February 12. After two hours of deliberation on June 6 the jury had reached a verdict. Alice showed very little emotion as she heard that she was “not guilty of murder” and “sane at the present time.” Ida wasn’t in the courtroom for the verdict but most of the spectators agreed with the jury’s decision although no one approached Alice to congratulate her. She left the courthouse in a buggy with her son, Estee, and returned home as a free woman. Next Otterbein Cemetery’s "Woolly Ghost"